Pakistan vs World XI: The live streaming and live cricket score will be available on PTV Sports, DSports, crictime, smartric, Gazi TV, CricketGateWay, and other channels mentioned below. Here’s how you to watch cricket match online. Pakistani team won the first T20 match. Today, it’s the 2nd Twenty20 game of the three T20Is series. With more victory, they will win the trophy. 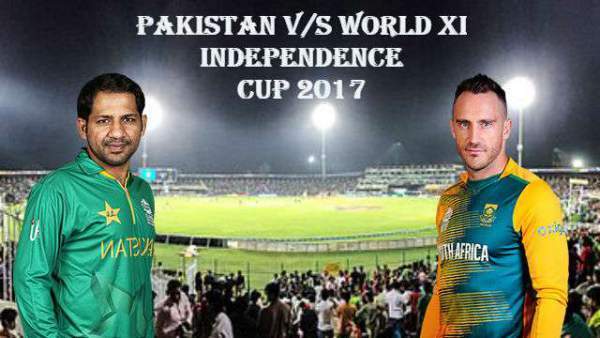 The World XI team led by South African’s Faf du Plessis will face the green shirts once again at the Gaddafi Stadium in Lahore. This tour marks the return of international cricket to Pakistan. The hosts celebrated it with a 20-run win on Tuesday. The last series hosted by Pak was in 2009 when Sri Lankan team arrived. But, the visitors witnessed a terrorist attack on them. If all goes well, then more teams will play in Pakistan. Around 25,000 audience came to watch their international team playing once again on home ground. They came to celebrate the resuming of international cricket on their home land. A similar number of fans are expected to come today as well. The figure may increase as their team won the 1st T20. Azam scored 86 from 52 balls with 10 fours and two sixes. Shoaib Mailk also made a good contribution by scoring 38 runs off 20 balls. From the visitors side, Darren Sammy and Hashim Amla made 29* and 26 runs respectively. The victory of home team in the first game makes the rest of the two T20 more competitive. The PAK vs WXI match will start at 7:30 pm IST (7 pm PKT). Pakistan is high on confidence and are expected to carry on the momentum. Come back for Pakistan vs World XI live streaming, live cricket score, commentary, ball by ball updates, match result, highlights, and much more. Stay tuned to TheReporterTimes for latest cricket news.